The Cleveland Browns have reached deals with veteran wide receiver Kenny Britt and center JC Tretter, the team announced. Britt is expected to sign a four-year, $32.5 million contract that includes $17 million guaranteed, a source told ESPN's Adam Caplan. Britt's eighth season in the NFL was his most productive, as he finished 2016 with career highs in receptions (68) and receiving yards (1,002), becoming the Los Angeles Rams' first player in nine years to reach the 1,000-yard milestone. The 28-year-old Britt hasn't necessarily made the most of his opportunities, however. He has started 41 of 48 games during the past three seasons but hauled in just 58 percent of his targets, a rate topped by 125 receivers. Before joining the Rams, Britt spent five seasons with the Tennessee Titans, who selected him with the 30th overall pick in the 2009 draft. He wowed the Titans early with his ability to get off the press at the line of scrimmage, catching 42 passes in each of his first two seasons, with nine touchdown catches in 2010. For his career, Britt has 309 receptions for 4,881 yards and 30 touchdowns. Tretter, who turned 26 in February, opened last season as the Packers' starting center but lost the job to Corey Linsley after suffering a knee injury in the seventh game. In 2014, the Packers had groomed Tretter to be their starting center, but he suffered a knee injury in the preseason and was also replaced by Linsley. Tretter finally regained the job back last offseason, when Linsley sustained a hamstring injury. After unsuccessfully trying to return late in the year, Tretter underwent knee surgery in January but said the recovery time wasn't expected to be long. Britt is coming off a career-best season with the Rams in which he caught 68 passes for 1,002 yards and five touchdowns. He played three seasons with the Rams after spending his first five years with the Titans. It remains to be seen how the 28-year-old will fit into the team’s passing attack, given that Cleveland’s top receiver from last season, Terrelle Pryor, is a free agent and there isn’t yet a solid plan at quarterback. Britt, though, is at least a piece who can help make last year’s 28th-ranked passing attack a bit better – or simply fill a major need if Pryor ends up signing elsewhere. The Browns are on the board. 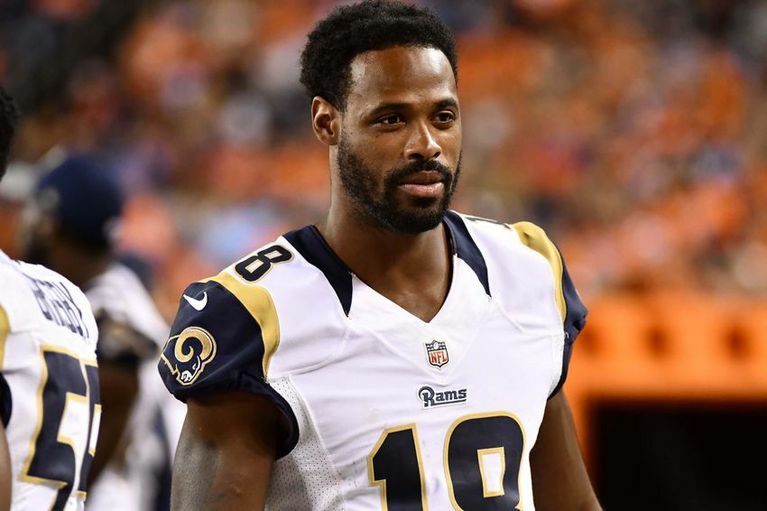 With more than $100 million in cap space to spend, Cleveland went after and got former Rams wide receiver Kenny Britt. The wideout's deal is worth $32.5 million over four years, according to NFL Network Insider Ian Rapoport. While this is not quite the top-of-the-line move to energize the Browns fan base, it does add a capable, big-body receiver still in his prime at an affordable price. Britt, 28, will be averaging a little more than $8 million per season after putting up a career-best 68 catches for 1,002 yards and five touchdowns last season. He also caught a career-best 61.3 percent of his passes. The thinking here may be that Britt is a good safety net for whomever the Browns bring in at quarterback. To have a career season with Case Keenum and Jared Goff under center is not easy, and showed Britt's continued maturity from raw, late first-round pick in 2009 to now. The soon-to-be official deal obviously raises questions about whether the team intends to re-sign Terrelle Pryor, who did not get the franchise tag from Cleveland and should get some looks on the open market. Pryor had a breakout year in 2016 after switching from quarterback, and put up 77 catches for 1,007 yards and four touchdowns in his first full year at receiver. Athletically, Pryor is the better option and can wear more hats in Hue Jackson's versatile offense. However, the Browns are looking for seasoned veterans to upgrade their extremely young roster. Britt immediately fits that bill. He joins 2016 first-round pick Corey Coleman on a team that many expected would come out of the gates quickly this spring. The problem, of course, is that Cleveland still requires some salesmanship. Like the Raiders in seasons past, they will have to overpay for middle-tier talent until the product catches up with the expectations. If nothing else, Britt will be a presence in the red zone for other teams to worry about. Could that be enough to entice another quarterback to visit Ohio? 0 Response to "Kenny Britt, JC Tretter agree to terms with Browns"